Adobe Flash software is the most advanced authoring environment for creating rich, interactive content for digital, web, and mobile platforms. Adobe Flash helps you build interactive websites, instructional media, engaging presentations, rich media advertisements, games and more. Designers and developers working on both Macintosh and Windows systems depend on Flash and the ubiquitous Adobe Flash Player software to ensure their content reaches the widest possible audience. • Adobe Photoshop and Illustrator import: Import Adobe Photoshop (PSD) and Adobe Illustrator (AI) files, while preserving layers and structure, and then edit them in Adobe Flash CS3 Professional. Optimize and customize the files during import with advanced options. • Frame-based timeline: Quickly add motion to your creations with the easy-to-use, highly controllable, frame-based timeline inspired by traditional animation principles such as keyframing and tweening. • ActionScript 3.0 development: Save time with the new ActionScript 3.0 language, featuring improved performance, increased flexibility, and more intuitive and structured development. • Sophisticated video tools: Create, edit, and deploy streaming and progressive-download FLV content with comprehensive video support. Ensure the best video experience with a standalone video encoder, alpha channel support, a high-quality video codec, embedded cue points, video import support, QuickTime import, closed captioning, and much more. • MP3 audio support: Integrate audio into your projects by importing MP3 files. Integration with Adobe Soundbooth makes it easy to edit files as needed, without requiring audio production experience. • Rich drawing capabilities: Visually adjust shape properties on the stage with smart shape drawing tools, create precise vector illustrations with the new Pen tool inspired by Adobe Illustrator, paste illustrations from Illustrator CS3 into Flash CS3, and more. • Extensible architecture: Leverage the Flash application programming interfaces (APIs) to easily develop extensions that add custom functionality. • Convert animation to ActionScript: Instantly convert timeline animations into ActionScript 3.0 code that can be easily edited, reused, and leveraged by developers. Copy animations from one object to another. • Adobe Device Central: Design, preview, and test mobile device content using Adobe Device Central CS3, now integrated throughout Adobe Creative Suite 3. 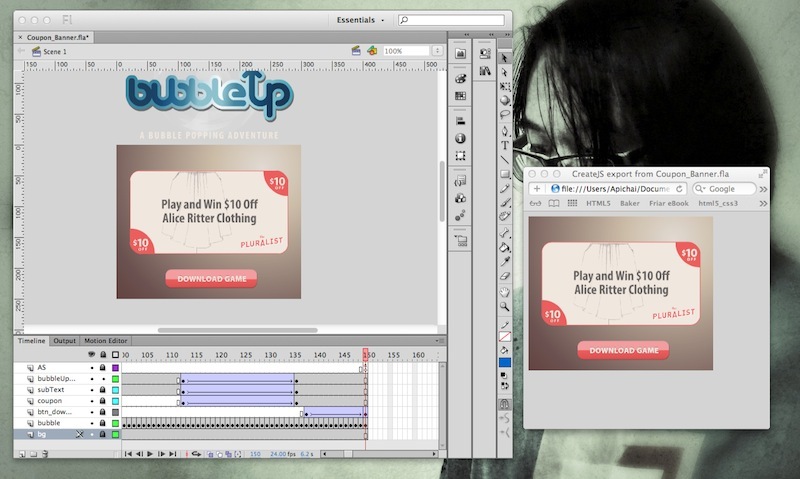 Create and test interactive applications and interfaces viewable with Flash Lite software. • Sprite sheet generation: Export symbols and animation sequences to quickly generate sprite sheets that help improve the gaming experience, workflow, and performance. • Wide platform and device support: Reach Android and iOS devices by targeting the latest Adobe Flash Player and AIR runtimes. • Prepackaged Adobe AIR application creation: Create and deliver applications with a prepackaged Adobe AIR captive runtime. Streamline application testing and enable end users to run your content without additional downloads. • Adobe AIR mobile simulation: Simulate common mobile application interactions like screen orientation, touch gestures, and accelerometer to help speed up testing. • Stage 3D targeting: Turbocharge rendering performance by using direct mode to leverage the open source Starling Framework for hardware-accelerated 2D content.